WRONG. You don't need to justify owning a GUN. Regulation of gun ownership is possible under the Constitution just as regulation of free speech is possible. Its funny how most of the same people who were claiming the second amendment only gives militia members the right to keep and bear arms now are claiming the 2nd amendment regulates gun ownership. Again the 2nd amendment exist so that average citizens can defend against invasions and tyrannical government. It was created so that you can go hunting and shoot burglars and other criminals. So the idea Constitution gives the government the right to regulation what guns I can and can't own is laughable. What you said amounts to saying burglars have the right the right to regulate what security alarms, guard dogs, window bars and other security measures you can have for your home. the supreme court said the second amendment does not preclude us from regulating firearms. Yes, the majority of gun owners and other pro-gun people do realize that wanton killing of innocent people can be regulated, just like threats against the security of a nation and its people can be flattened on their asses. This country and both parties have gone crazy. Democrats think abortion is a right and Republicans think we can't ban any gun of any kind. Y'all have both made it more dangerous, silly and immoral. After a bit more drivel he seems to remember that he was in Canada and his train of thought totally derails. He wondered if Canadians can donate money to US political candidates, (they can't, it's a felony), and then just sighs and giggles while Moore wrestles the microphone away. Hoggy is just settin' himself up for a talk show gig or somethin' similar. He's already figured out the lib formula: say ridiculous, partisan, nonsense and you'll quickly become the face of the Democratic party. Socialist Girl is a great example of this. Hell, maybe Hoggy and Mimi will get signed onto The View. Hoggy is def feminine enough to fit right in. yeah and y'all say we are violent for calling trump names. 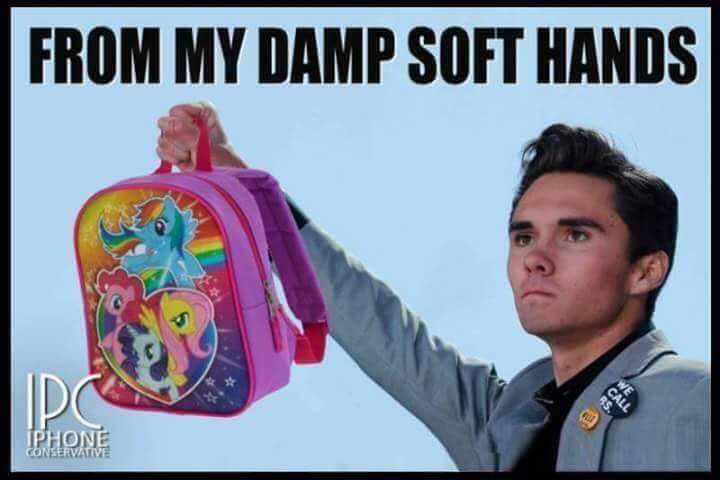 Why bother replying if it is going to be as weak as Hogg-boy himself? You need a tissue and a soy latte? the gun addicts are just like girls who think they have a right to an abortion for any reason. no they don't. and no you don't need an ar15. You don't need a cell phone, a flat screen TV or a personal computer, but you have the right to own them.